Daniel Schreiner: Bio & Choral Music | Santa Barbara Music Publishing, Inc.
Daniel Schreiner (b. 1990) has his undergraduate degree in Choral/Vocal Music Education from Central Washington University. In his time at CWU, he sang in the CWU Chamber Choir, CWU Vocal Jazz 1, as well as participated in CWU’s award winning opera program. He studied composition with Dr. Elaine Ross and conducting with Dr. Gary Weidenaar and Dr. Nikolas Caoile. 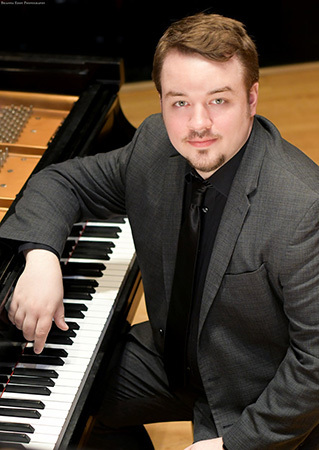 He was the recipient of the 2011 Opus 7 Undergraduate Composition Award for his piece “Cain,” which was premiered in February 2011 by the Opus 7 Vocal Ensemble. Daniel currently lives and teaches in Western Washington. He teaches high school choir, serves as the Music Supervisor for ManeStage Theatre Company in Sumner, WA, and teaches private voice and piano. He sings with the PLU Choral Union, the Wellspring Ensemble, and Chor Anno. Daniel Schreiner has 4 titles published with Santa Barbara.